For most children in wheelchairs, it is very difficult to get a jacket on due to limited arm range of motion, which takes more time to get them bundled up during these cold winter months. These two different types of adaptive coats, can easily be worn, while in a wheelchair. 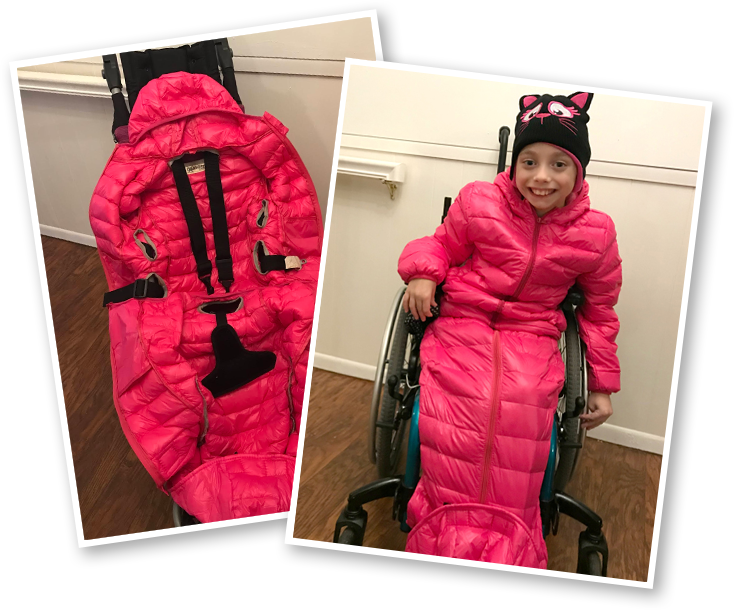 X-Ability has made a body coat that lays inside the wheelchair, the child then sits in the chair and the coat can be quickly zipped up over the child. Making it quick and easy to endure the cold temptures the winter throws our way here in New England. Adaptations by Adrian is more of a poncho type coat that can easily go over the child’s head and rests over their body so that you do not need to worry about getting their arms through any sleeves. These can be custom made with different materials and custom monogramming or a pre-made poncho can be purchased as well. Adaptations by Adrian also offers adaptive hats, footwear, bags, mittens and more! Whichever you choose, you will have a much easier time getting out and about with your child during those cold, cold winter months!